« When people fight, they are so busy fighting, they give thought neither to ‘why?’ nor to ‘better solutions’. At Focus we celebrate our successes and the attainment by our mediators of significant professional achievements. Our family mediators work hard towards the achievement of their recognition as a fully competent mediator, qualified to mediate cases for the Legal Aid Agency. Whilst very few of our cases are legal aid these days, we still put our trainees through that competence assessment, simply because it is so demanding and is the Gold Standard for family mediators. Our trainees work hard under close supervision with very experienced mediators and this training takes one to two years of intensive work. We have two professional Practice Consultants in our team to help with this training. 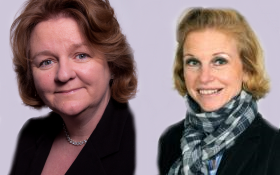 This year we have got two mediators through their competence portfolio, Geraldine and Joanna. They have been duly crowned and handed their magic wands (essential equipment for every mediator) as well as being supplied with a large amount of ‘Emergency Chocolate’ to help them through those extra stressful and difficult cases. Well done Geraldine and Jo! This entry was written by focusmediation, posted on March 26, 2014 at 10:30 am, filed under Family, Mediation and tagged ADR, Alternative Dispute Resolution, Conflict, Dispute resolution, Family, Family law, family mediation, Legal aid, Mediation, mediation services, Relationship Breakdown, Separation, Services. Bookmark the permalink. Follow any comments here with the RSS feed for this post. Post a comment or leave a trackback: Trackback URL.